A true Southern affair: The NotWedding on Thursday, July 21, is the event of the summer season! Complete with a sit-down dinner, an emotional ceremony and a dance-party reception, The NotWedding has become a killer alternative to a bridal show. Hand-picked vendors perform their services as they would at a real wedding, and the “wedding guests” get to hear the music, taste the cakes, and touch the linens… while enjoying a night of great food, dancing and surprises. 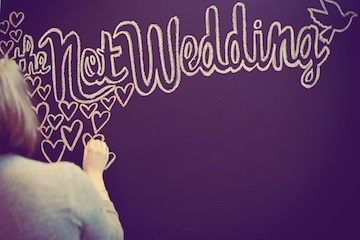 The NotWedding will most definitely have an incredibly, very fun Southern wedding event, and y’all can attend for just $40. Hopefully y’all can make it, but if not, take advantage of The NotWedding Snag the Swag bonus offers! It’s a little way of connecting even more brides with awesome businesses. Unique wedding deals are offered at incredible prices, allowing brides-to-be (and everyone else who loves pretty things and good deals) an opportunity to experience new and unique options for their big day. Photography, Crafts, Stationary, Wedding Coordination, even Vintage Furniture Rentals to create your event truly one of a kind are waiting for y’all in Snag the Swag! The fabulous NotWedding event is at Ambient + Studio on Thursday, July 21 and tickets are available by clicking on The Not Wedding’s website!